Perchlorate in Martian soil: The chemical that could be dangerous to astronauts. A chemical found in Martian soil might make it more dangerous to establish a permanent settlement there. 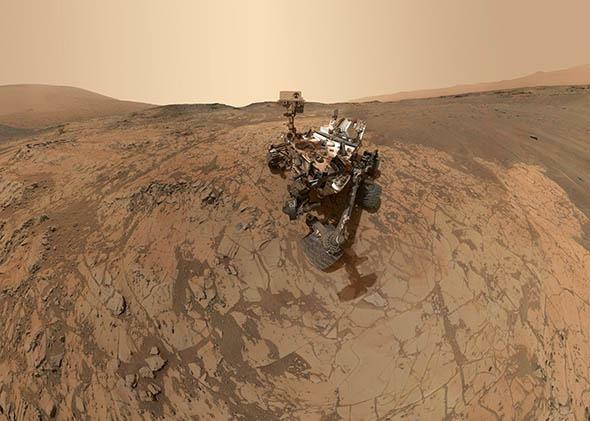 A self-portrait of NASA’s Curiosity rover shows the vehicle at Mars’ Mojave site. Curiosity’s cousin the Phoenix lander has found a chemical in Mars’ soil that has implications for the future of humanity on the Red Planet. This article is part of Future Tense, a collaboration among Arizona State University, New America, and Slate. Future Tense explores the ways emerging technologies affect society, policy, and culture. On Thursday, April 9, Future Tense will host an event in Washington, D.C., on the future of space exploration. For more information and to RSVP, visit the New America website. When we think of astronauts, most of us imagine perfect physical specimens—they should be brilliant, yes, but they should also be stoutly built models of health. But some new discoveries suggest that even the best of us may be ill-suited for the environments we’ll explore in the future. To the contrary, making ourselves at home on other worlds may mean learning to live with states of impairment. Consider the case of Mars, a planet that has long been upheld as an optimal candidate for colonization. The website of Mars One—the widely criticized “not-for-profit foundation that will establish a permanent human settlement on Mars”—lists six reasons why the red planet is ideal. Among other things, the site notes that it has a limited atmosphere, its days are similar to ours in length, and it is relatively temperate. Mars appeals to our terrestrial narcissism: We want to go there because it’s a little like what we have here, such that we could call it home without having to change quite so much about it. Mars also appeals because of the evidence of water we’ve found there, especially in the soil. 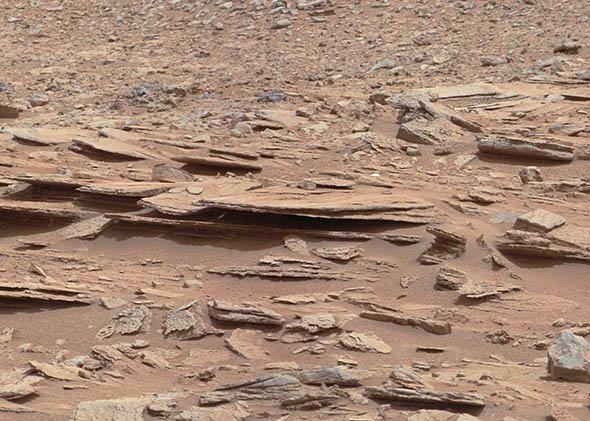 The trouble is that water isn’t the only substance we’ve discovered in the dirt of Mars. In 2009, scientists responsible for the Phoenix lander reported that they had discovered a statistically significant sample of perchlorate within the soil of the “polygon-patterned northern plains of the Vastitas Borealis.” If you’re left wondering what on Earth this might mean, you’re not alone. One of the investigators would later claim that his team had to look up the substance to find out what, exactly, they’d discovered. Perchlorate is, among other things, dangerous to the human body, capable of disrupting the basic functioning of the metabolic system. It interferes with our ability to absorb iodine, which is essential to the production of thyroid hormones. While most of us understand our metabolisms only well enough to declare that our own are fast or slow, they actually work through a delicate daisy chain of chemical interactions. When something disrupts a single link in this process, as perchlorate does, the changes can reverberate throughout the body, producing drastic changes in mood, appetite, temperature regulation, sleep cycles, and more. Starting in the 1950s, perchlorate was often used medically to treat hyperthyroidism. But in the 1960s, physicians linked medically prescribed potassium perchlorate to a number of deaths by aplastic anemia and severe agranulocytosis, two blood disorders. At the time, doctors decided the drug’s benefit outweighed this relatively small risk, but it ultimately fell out of favor, replaced by other antithyroid agents. Because they rarely prescribe it, physicians have performed relatively little research on acute perchlorate dosages in the past four decades. Here on Earth, perchlorate is uncommon, but it’s also not unheard of. It’s used in some rocket propellants, partially because it’s inert at low temperatures but explosive at higher ones. Because it’s highly water-soluble, it tends to wash away quickly when it finds its way into the ground, sometimes making its way into reservoirs. In Nevada, for example, industrial contaminants have left some drinking water with perchlorate concentrations averaging 1.2 parts per billion. While this is clear cause for regulatory concern, it still falls well below the maximum allowable levels that the FDA has established under the Safe Drinking Water Act, partly because most research has been inconclusive on the environmental health effects of these chemicals, even at much higher concentrations. Perchlorate sometimes appears naturally in the soils of very dry environments, such as the Atacama Desert in South America. Researchers like Alfonso Davila, a planetary scientist affiliated with the SETI Institute, study the Atacama and similar environments because they feature conditions analogous to those that we’re likely to encounter on Mars. Perchlorate accounted for somewhere between 0.4 and 0.6 percent of the Phoenix lander sample by weight. Davila explained to me that this is an amount several factors of magnitude greater than those found anywhere here on the Earth (including Nevada), on the moon, and elsewhere. This enormous concentration might have been the product of an environmental anomaly—some quirk of polar conditions, perhaps. But subsequent analysis of both data from earlier missions and later explorations has suggested that perchlorate is widely distributed across the planet in equivalent or greater concentrations. Indeed, as Chris McKay, of NASA’s Ames Research Center, told me, it may constitute as much as 1 percent of the soil’s weight in some places. Curiosity used its Mast Camera (Mastcam) during the mission’s 120th Martian day, or sol, on Dec. 7, 2012, to record this view of a rock outcrop informally named Shaler. Some of the outcrop’s striking layers are at angles to each other in a pattern called crossbedding. Little here on Earth prepares us for the amount of perchlorate we’re likely to encounter on Mars if we ever make our way there. McKay told me that the doctors he’s spoken with have been divided on the threats of Martian perchlorate. Some shrugged it off, he said, suggesting it would be easy to wash the chemicals out of the body, while others proposed that if we encountered similar conditions on Earth “the entire planet would be a Superfund site,” as McKay paraphrased. Reports suggesting that Mars’ perchlorate-riddled carpet makes the planet “toxic” to humans may be slightly overblown, though it presents real dangers (more on that in a minute) for developing children. Though perchlorate is probably not, contrary to some early suggestions, present in sufficient quantities to manufacture rocket fuel, it might still serve as a resource. For example, Davila told me that it might actually be a source of breathable air thanks to the oxygen it releases when it breaks down. Moreover, the inhibitory effects of perchlorate in the body are relatively short-lived: While it can block thyroid function, it doesn’t actively destroy the gland. Despite its endocrine consequences and the potassium perchlorate-associated deaths recorded in the 1960s, researchers have detected relatively few significant health risks in adult populations exposed to perchlorate. Researchers have imagined a variety of mechanisms by which astronauts might avoid exposure, but the immense quantities distributed across the surface of the planet likely make some contact inevitable. Given how difficult it is to accurately assess the threat of perchlorate on Earth, we may be better off assuming that it will present a danger to humans on Mars, not asking how they might avoid that danger. Instead of asking how we can stay healthy, we should look more carefully at the consequences of falling sick. It’s entirely possible to function without a working thyroid. I know this in part because I’ve managed to do so for some time now. When I was in my mid-20s, my endocrinologist discovered that I had a disorder called Hashimoto’s disease. As she explained to me, this meant that my body was producing white blood cells that treated the thyroid as an alien invader. These autoimmune attacks left the gland sheathed in scar tissue and unable to function at an ordinary level. Though the condition was irreversible, treatment was relatively simple: I took a single pill each morning before breakfast, a supplemental dosage of hormones that replaced the ones my body could no longer produce at adequate rates. Years later another endocrinologist found a small nodule on my thyroid that turned out to be cancerous. Within a month, a remarkable surgeon had removed my thyroid and some of the surrounding lymph tissue from my neck. Afterward, my synthetic hormone dosage more than doubled, but little else changed in my life. While massive perchlorate doses may have as yet unknown effects, I suspect that I would be safer on Mars than most. Almost accidentally, my own body has encouraged me to adapt—with the help of medication—to the conditions Mars would likely force on it. It can take time to dial in a proper dose of synthetic thyroid medication, so erratic patterns of exposure might lead astronauts to experience waves of irregular thyroid function. Having long since achieved hormonal equilibrium, I would be almost healthy there, at least by comparison to those presently without endocrine complications. I’m happy here on Earth, and I’d probably make a lousy astronaut in any case. Nevertheless, it’s worth remembering that our possible interplanetary future may challenge our expectations about what wellness really means. Ultimately, perchlorate is more dangerous to fetuses and nursing children than it ever could be to adults. Patrick Lin and Keith Abney have argued in Future Tense that the largely unknown consequences of pregnancy in space will be a key ethical issue for long-term space exploration. Martian perchlorate makes this issue all the more urgent, not least of all because regular thyroid function is essential to regular childhood development. Even bodies without working thyroids produce a protein that transports iodide to cells. Known as the sodium-iodide symporter, or NIS, this protein exhibits a surprising affinity for perchlorate, which accounts for its disruptive effect. Nancy Carrasco, a Yale professor of cellular and molecular biology, told me that NIS also helps transmit iodide from mothers to fetuses and nursing babies. “Normally,” she explained by way of example, “iodide is concentrated in maternal milk, but if someone is exposed to perchlorate, that baby will be exposed to more perchlorate and less iodide.” Similarly, during pregnancy, perchlorate can prevent sufficient iodide from passing into the placenta, and therefore into the thyroid of the fetus. In both cases, the developing body can be left incapable of producing its own thyroid hormones, which can result in permanent and irreversible cognitive impairment. Finding solutions to such problems may require radically rethinking the ways that we care for ourselves and those around us. Much as scientists such as Davila and McKay study environments like the Atacama to approximate conditions on Mars, it might behoove us to study bodies like mine that tell us something about what it would be like to live there. Imagining life on other planets often involves imagining how we’ll make alien environments a little more like those that we have at home. It should be just as important to recognize that living elsewhere will make us a little more alien.